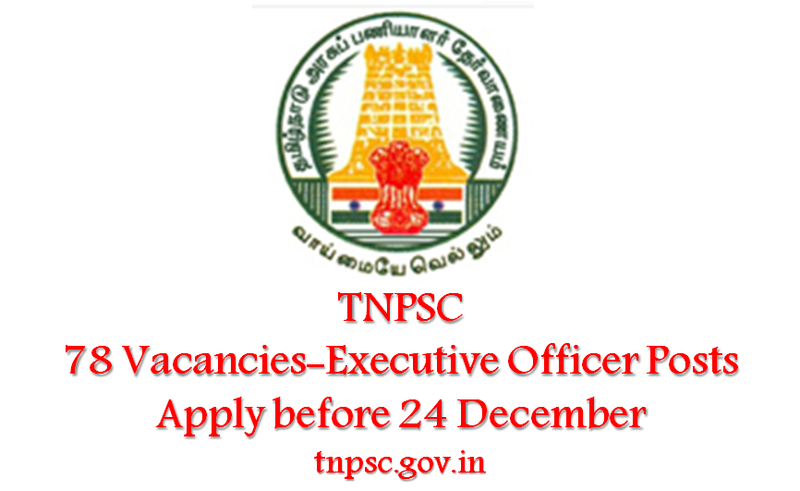 Tamil Nadu Public Service invited applications for recruitment to the post for Executive Officer under Grade III and Grade IV, only candidates professing the Hindu Religion as required by Section 10 of the Tamil Nadu Hindu Religious and Charitable Endowments Act-1959 (TamilNadu Act 22 of 1959) are eligible to apply. The candidates eligible for the post can apply online in prescribed format on or before 24 December 2016. Executive Officer Grade III/IV: candidate should have a Degree in Arts or Science or Commerce of any University recognized by the University Grants Commission. Age Limit: candidate should be 25 to 35 years of age ( there is no maximum age limit for reserved category candidates). Candidates will be selected on the basis of written examination and Physical fitness test. The written examination will constitute of two papers I and Paper II, Paper I will test the candidates on the subjects of General Studies, Aptitude and Mental Ability Test and General Tamil/English and in paper II candidates will be tested on the subject Code named 180 and 181. Eligible Tamil Hindu Graduates can apply online through the official website(tnpsc.gov.in/) in prescribed format, on or before 24 December 2016.